Betty Island light is shown from a white pyramidal tower, 30ft high. This is the third lighthouse on this station. 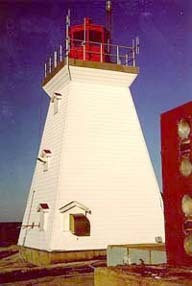 The original tower, lit in 1875 was a tapered square wood tower, white, with 2 red bands, attached to a keeper's house. This tower was replaced in 1939 by a square wood dwelling with a lantern on the apex of the roof. The house was removed before the light was automated in 1983. South Shore, 3 km off Prospect, on Brig Point, the outer tip of Betty's Island. 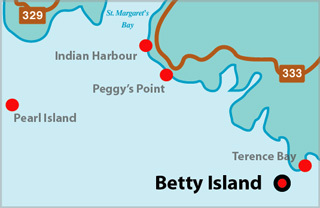 Betty Island, 92 feet high and mainly wooded, lies off the entrance to Prospect Bay. Light Height: 063ft feet above water level. Structure Type: Square tapered white wooden bulding. Red lantern.